Many thanks to William Atkinson for his 1964 - 1965 Membership Card and these press clippings from the Whitby Gazette. 1964 - 1965 William Atkinson's Membership Card for WSAA. Courtesy of William Atkinson 30/12/2012. William Atkinson 5th (personal records). October - 5 lb 02½ oz. November - 12 lb 06 oz. December - 6 lb 12½ oz. January - 8 lb 13 oz. February - 8 lb 00 oz. March - 18 lb 09 oz. His total weigh-in - 59 lb 11 oz. A whopper of a catch! 1965, courtesy of William Atkinson 30/12/2012. A record total of 7½ cwt* of fish was caught by members of Whitby Sea Anglers Association last winter, reported the secretary Mr. RP Jacomb, at the association's annual dinner at the George Hotel on Saturday night. Mr. Jacomb said this was more than 60 per cent above the previous record. Several other records had been broken in an exceptionally good season. The heaviest individual total was 105 lb 05 oz caught by Chairman Mr. R Wood. This was well above the previous record Mr. J Thompson broke the record for the heaviest single weigh-in with 20 lb 05 oz, but only a few days later Mr. A Corner also beat this with 24 lb 15 oz. Mr. Corner also caught the heaviest fish, weighing 6 lb 13½ oz. Mr. Jacomb said the average attendance at competitions was 14 and the average catch 9 fish. Mr. Jacomb paid tribute to the Chairman's work which he said, had held the association together when a crisis developed after the death of the former secretary Mr. Jack Brown. Mr. Wood, who presided, said the statistics were an effective answer to some reports that fishing had been inconsistent and rather poor. On the contrary, it had been one of the best winters for years with the fish "wonderfully cooperative." The club spirit was very good. Mr. Wood said the trophy presented to Mrs. Doris Brown in memory of her husband's work for the association had been greatly appreciated. 1. Ron Wood, 105 lb 05 oz. 2. Charles Prodham 86 lb 05 oz. 3. Gerry Thompson 80 lb 03 oz. 4. Ronnie Johnson 66 lb 07½ oz. 5. William Atkinson 59 lb 11 oz. Heaviest fish, A. Corner 6 lb 13½ oz. Mr. Wood presented Mrs. Jacomb with a box of chocolates. Later there were games and a film show. Several records were broken by members of Whitby Sea Anglers Association during their winter competitions. First and foremost was the weight of fish landed by competitors a total of 7½ cwt*. constituting a new record. Mr. R Wood, chairman of the association , presided at the annual dinner and prize giving at the George Hotel, Whitby, on Saturday night, and he was the winner of the aggregate competition with a total weight of 105 lb 05 oz, well above the previous record. Mr. RP Jacomb said the total catch by members was well above average, and was, in fact 60 per cent. more than the previous record. They had had a very good season, and Mr. J Thompson established a new record when he weighed in a catch of 20 lb 05 oz. This was a record that did not last long, however, for a few days later MR. Arthur C Corner had a total aggregate of 24 lb 15 oz. He also caught the heaviest fish landed in competition during the season, weighing 6 lb 13½ oz. The average number of competitors at each competition was 14, and the average number of fish caught was nine per person. Mr. Jacomb paid tribute to Mr. Wood, who when a crisis arose following the death of Mr. Jack Brown, their secretary, stepped into the breach and did good work for the association. Describing the statistics as an effective answer to reports that fishing had been inconsistent and rather poor Mr. Wood described the winter as one of the best for years, during which the fish had been "exceptionally cooperative." He described the club spirit as very good, and said they all appreciated very sincerely the new trophy presented for competition by Mrs. Doris Brown in memory of her husband. Mrs. Jacomb presented prizes as follows. Mrs. Jacomb was presented with a box of chocolates by the Chairman, and later there were games and a film show. Members of Whitby Sea Anglers Association caught a record total of 9 cwt*. 2 st. 3 lb. of fish in their winter competitions. This was reported by Councillor T. Johnson, secretary, at the annual dinner at the Flask Inn, Fylingdales, on Friday evening. Councillor Johnson said this compared with 7½ cwt. the previous year. The heaviest individual total, 1 cwt 8 lb, was caught by W . Atkinson and this , too, was a record. Councillor Johnson said the average attendance at fishing competitions was 16. The annual angling festival had been on October 23rd. 1. William Atkinson 1 cwt 1 st 8 lb. 2. Ron Wood 7 st 4 lb. Sealed weight Rodney Wood 3 lb 05½ oz. After dinner there was a beetle drive. Results: Mrs. J Cockerill; 2. S Worthy; 3. R Turner; 4. Mrs K. Thompson. * Ingrid Wren, 1st female member, set up Ingrid Flute Holiday Homes, in Scarborough. October - 25 lb 00 oz. November - 24 lb 04 oz. December - 27 lb 03½ oz. January - 18 lb 03½ oz. February - 11 lb 01 oz. March - 29 lb 13 oz. His total weigh-in - 135 lb 09 oz - New club record. Press cutting courtesy of Dave Perrett and The Yorkshire Post. Fish catch themselves when Mr E Shepherd, a Bridlington coastguard, decides on haddock for lunch. These pictures reveal his secret. Left: He digs for sandworms, baits his hooks and buries his line at low water before going on watch. Centre: Off duty at low water again, he pulls in his line. While he has been working, the fish have been biting. 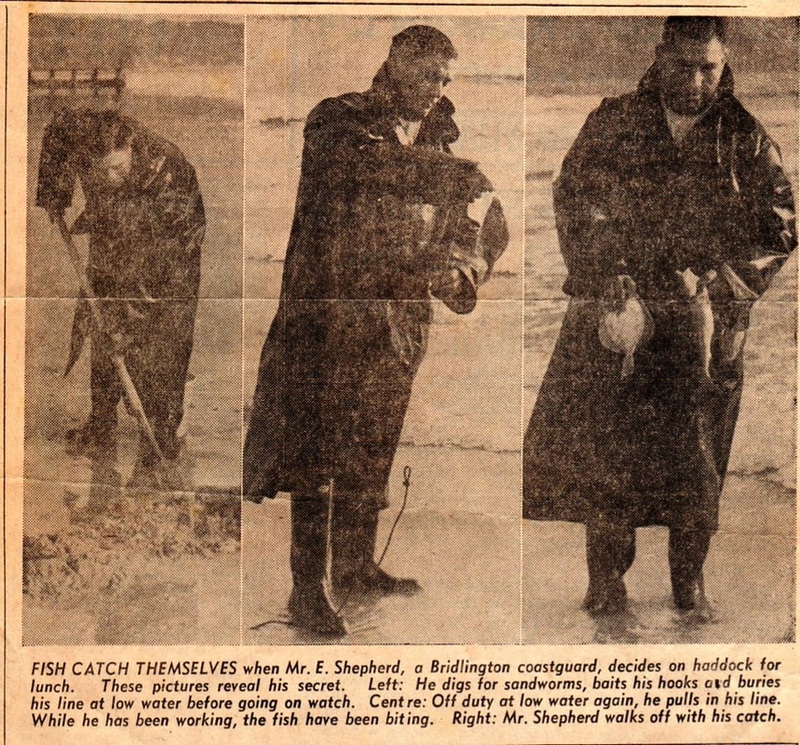 Right: Mr Shepherd walks off with his catch. Trophies and other prizes won during the winter fishing competitions were presented at the annual dinner of Whitby Sea Anglers Association at the Flask Inn, Fylingdales, on Friday evening. Two Whitby fishermen, skipper Eric Taylor and Mr. Sam Winspear, were among the guests. Mr. Ron Wood, chairman, reported keen interest in the competitions. He said the total weight of fish landed, 73 stone 5 lb 1 oz, was only 1 stone 11 oz less than last years record aggregate weight. Sealed weight, Ron Johnson, 22 lb 16½ oz. 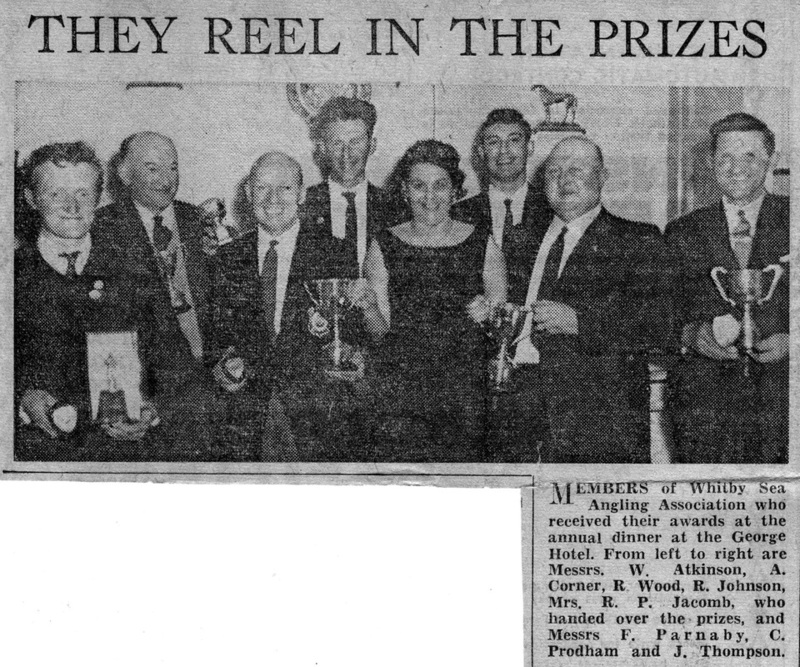 In the press clipping from 1970/1 season Mr. Swales reported that 1966/7 had weighed in over 1,000 lb of fish. October - 13 lb 12½ oz. November - 17 lb 04 oz. December - 32 lb 04½ oz. January - 35 lb 06 oz. February - 7 lb 06 oz. His total weigh-in - 111 lb 12 oz. Mr. Ron Wood, chairman of Whitby Sea Anglers Association, presiding at the annual dinner at the Flask Inn (Mr. and Mrs. Clifford Isle) on Friday evening, said anglers fully supported Whitby's inshore fishermen in their views that over-fishing by big foreign herring fleets was ruining the inshore cod fishing. Anglers had had their poorest winter season for some years, and in weekly competitions, 35 st 9 lb 10½ oz, showed a considerable fall on the previous year's total, and records showed that it had dropped in every winter over the last few years. He said this proved that over fishing during the herring season must be responsible, and anglers were fully in agreement with the bid by inshore fishing interests to secure a cessation of all herring fishing over the next few years within twelve miles of the coast from Longstone Lighthouse to Flamborough Head to give herring stocks a chance to build up again. Mr. Wood welcomed guests at the dinner who included Mr. J Stanley Cartridge J.P., a vice-president, and Mrs. Cartridge, and Councillor and Mrs. WH Whorlton. The Chairman said membership had remained static at 36 but the spirit of the Club was very high indeed. he thanked his fellow officials, Mr. John Swales, secretary and Mr. Frank Parnaby, treasurer, saying that Mr. Swales had done a very good job indeed during the year. In this he had received the ready help of his wife. Sealed weight, E Hall 3 lb 05 oz. The Chairman, whose wife presented Mrs. Gillian Swales with a box of chocolates announced a new trophy had been given to the Association by Councillor Harry Whorlton for the smallest aggregate weight by a member in the winter competitions. 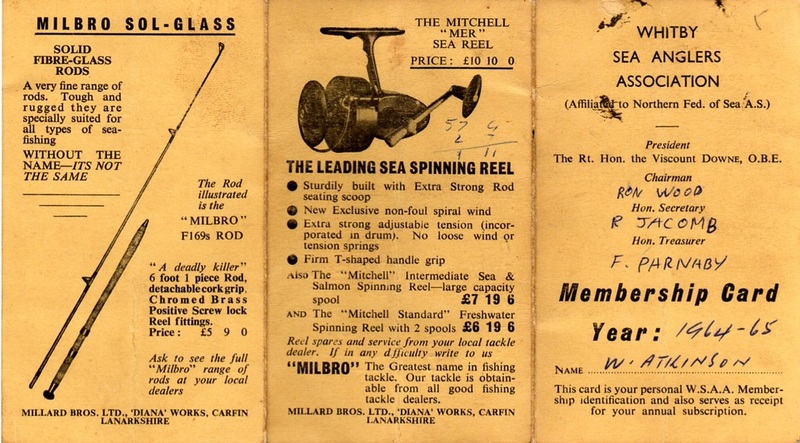 In the social which followed the presentations there was a cod drive, run on the same lines as a beetle drive, in which the body, head, tail, eyes, fins and barbel of a cod had to be drawn on the throw of a dice. prizes were presented to those returning the top three scores. Whitby Gazette 1968, courtesy of William Atkinson 30/12/2012. October - 4 lb 00½ oz. November - 5 lb 14½ oz. December - 7 lb 10 oz. January - 6 lb 14 oz. February - 11 lb 06 oz. March - 2 lb 00 oz. His total weigh-in - 38 lb 01 oz. October - 17 lb 07 oz. November - 41 lb 04 oz. December - 18 lb 04 oz. January - 4 lb 07 oz. February - 4 lb 02 oz. March - 8 lb 08 oz. His total weigh-in - 94 lb 00 oz. Whitby Gazette 24th April 1970, courtesy of William Atkinson 30/12/2012. Trophies won by members of Whitby Sea Anglers Association during the autumn and winter competitions were presented at the annual dinner at the Flask Inn (Mr. and Mrs. Clifford Isle) on Friday evening. About 50 members, wives and friends were present, and Viscount Downe, of Wykeham Abbey, the Association' president, paid a brief visit to the function. Mr. Ron Wood, chairman, presided, and said Lord Downe, whose wife had recently given birth to their second child, was sorry he could stay but had to return to Wykeham. "Next year we hope Lord and Lady Downe will be able to attend our dinner and prize giving," he added. he said that a Whitby garage owner, Mr. Alan Marshall, himself a keen angler, had given the Association a new trophy - the Argyle Garage Junior Cup. As with all the trophies, a plaque would go with it. The Chairman said he was pleased with the overall attendance at the weekly competitions, although sport had been poor. At the same time the spirit in the Association remained high. Mr. John Swales, secretary, reported there was 37 members including three juniors in the Club and there had been an average attendance of 20 at matches. Unfortunately there had been few fish about. 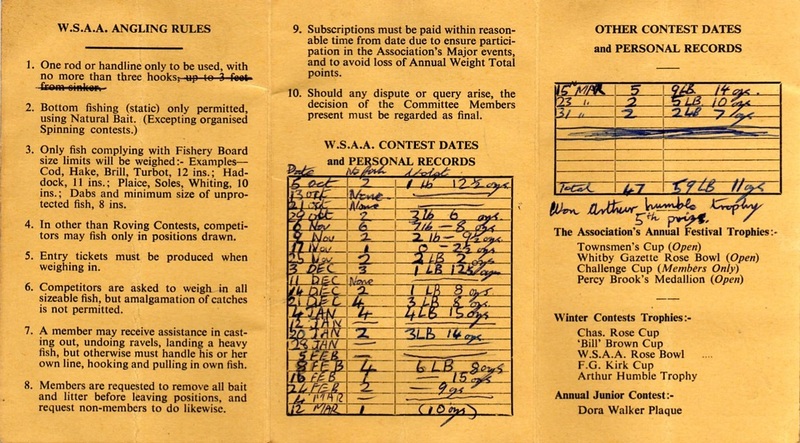 In 1966-7 members had 499 lb and in the season just ended 498 lb, 28 members catching fish. The secretary complimented Geoff Calvert on landing the heaviest fish of the winter, a cod of 15 lb 04 oz, saying it was only 9 oz short of the club record set up by J Middlemas. In a reference to the summer flat fish competition Mr. Swales said only 3 members caught fish, and he was lucky enough to win the contest. Mrs. DW Johnson, wife of the treasurer, presented the awards as follows. Lowest aggregate G Thompson 2 lb 10 oz. Junior Trophy, Rodney Wood 13 lb 11 oz. Mrs. Wood, the chairman's wife, presented Mrs. Johnson with a box of chocolates, and Mr. Wood thanked Mr. Swales for his work. He also spoke of everyone's regret that one member, Mr. Ray Moore, would shortly be leaving the district. William Atkinson 3rd (personal records). October - 6 lb 01 oz. November - 2 lb 10 oz. December - 12 lb 07 oz. January - 3 lb 08 oz. February - 9 lb 05 oz. March - 4 lb 10 oz. His total weigh-in - 38 lb 09 oz.